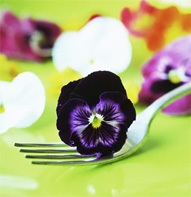 There are plenty of reasons to chow on edible flowers. They are rich in cancer-fighting antioxidants, contain essential amino acids, some are thought to strengthen the heart's capillaries, and they offer a wide variety of flavors to go with any dish. But be careful, there are more poisonous flowers out there than edible ones, so make sure you have the right genus and species of flower before you eat it. Also, make sure the flowers have not been sprayed with harmful pesticides, insecticides, fertilizers, or anything harmful to your health. Don't eat edible flowers unless you are sure they are in fact edible (so, don't go out in the yard and just start eating flowers). Preheat oven to 400F, and prepare a baking sheet with silpat or parchment. Sift the flour, salt, cinnamon, and baking powder together. Add the butter in small pieces and begin to work into the flour mixture with your fingers. The mixture is the correct texture when it is crumbly with some larger pieces of butter here and there. Make a well in the center and add the cream, rose water, and vanilla. Mix gently until you have a sticky ball of dough. Turn out on a floured surface and knead a few times to help it hold together. Roll out, 3/4 inch thick and cut with a large cutter. Transfer to pan, brush with beaten egg yolks and sprinkle with sugar. Let stand for 20 minutes. Bake for 15 -20 minutes, or until tops are golden. Allow to cool slightly. 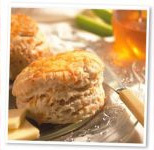 Some fantastic eating if you're up for something different! 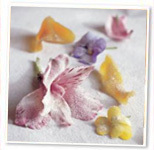 For more ideas, here is a chart of edible flowers and their distinct flavors: http://homecooking.about.com/library/weekly/blflowers.htm.